Move over, Charlie Brown! Lucy takes the spotlight in this latest collection of Peanuts comics for kids. 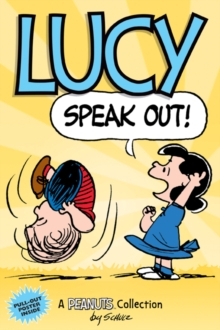 In this delightful collection of classic Peanuts comics for younger readers, Lucy rallies her friends to speak out for equal rights for women. When she's not dedicated to social causes or dropping fly balls in the outfield, Lucy decides to write a biography of Beethoven, much to Schroeder's chagrin. Meanwhile, life in the Peanuts gang is as hilarious as always: Woodstock takes up farming, Peppermint Patty struggles to make the grade, and Charlie Brown suffers a mysterious illness that lands him in the hospital. You won't want to miss this latest edition of outstanding Peanuts fun.